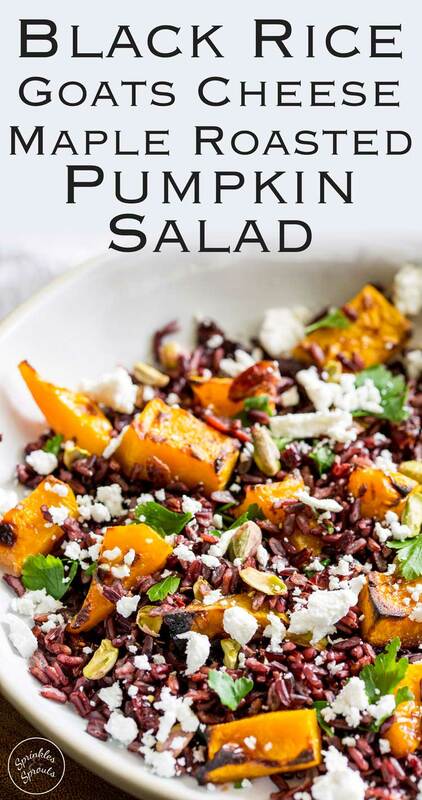 This Black Rice, Goats Cheese and Maple Roasted Pumpkin Fall Salad has it all!!! Nutty sweet black rice, sweet smoky pumpkin, fresh tangy goats cheese, sweet cranberries and crunchy pistachios. Delicious as a main or a side, this is the perfect dish for fall. And Black rice is my latest addiction, regular readers will know I get food addictions!!! Charred lemon is still a favourite, although I progressed to charred lime in this weeks gin and tonic. And my pasta addiction hasn’t wained in 25 years!!! But Black Rice is a new one, I love the sweet nutty taste and the fact it doesn’t take forever to cook like wild rice or brown rice. 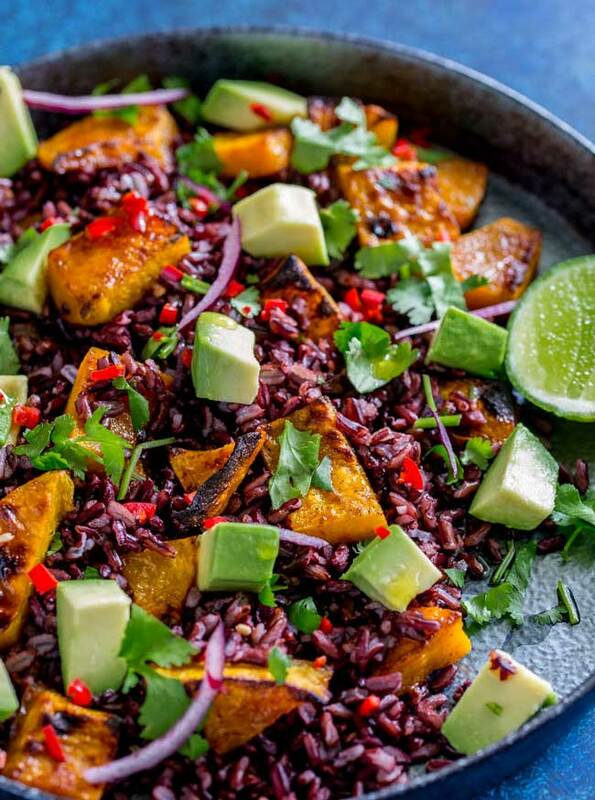 I do wish black rice stayed black after cooking, the colour straight from the packet is so dramatic – although I do love the red mahogany hue it has when cooked. 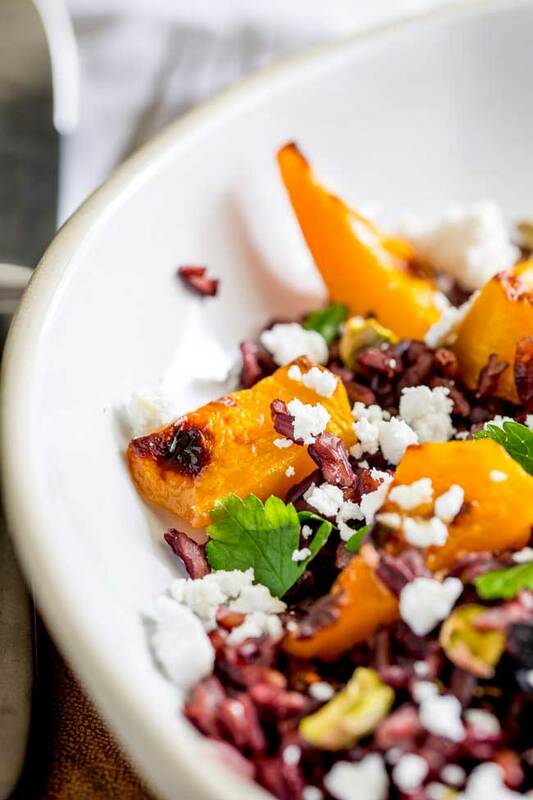 That is what makes this Black Rice, Goats Cheese and Maple Roasted Pumpkin so pretty. You have the gorgeous red/purple rice, the vibrant orange roasted pumpkin, the bright white goats cheese and the flashes of green/pink pistachio. It is a technicolour salad perfect for fall. 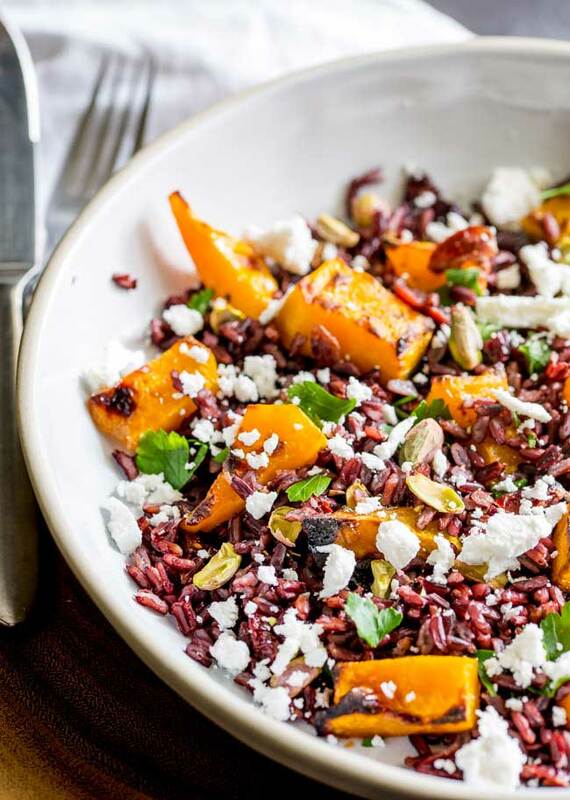 Just look at the beautiful colours in this Black Rice, Goats Cheese and Maple Roasted Pumpkin Salad. The pumpkin is coated in a glaze of olive oil and maple syrup and then roasted until tender and lightly charred. Sweet tasty chunks of fall yumminess!!! This sweet pumpkin is paired with creamy tangy goats cheese. OH SO GOOD!!!! Doesn’t this picture makes you drool!!!!! I made a big batch of this up and once I had eaten pretty much my body weight up, I handed out a couple of boxes to friends for a final taste test. And I know my gorgeous friends appreciate the food and are my most honest critics. This salad could have won awards. The feedback was sensational!!! I am going to make a side of this for my Thanksgiving menu this year. It is perfect as a side or a vegetarian main. WINNER!!! 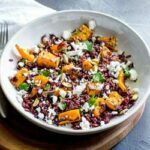 If you love this recipe for Black Rice, Goats Cheese and Maple Roasted Pumpkin Fall Salad why not pin it for later. 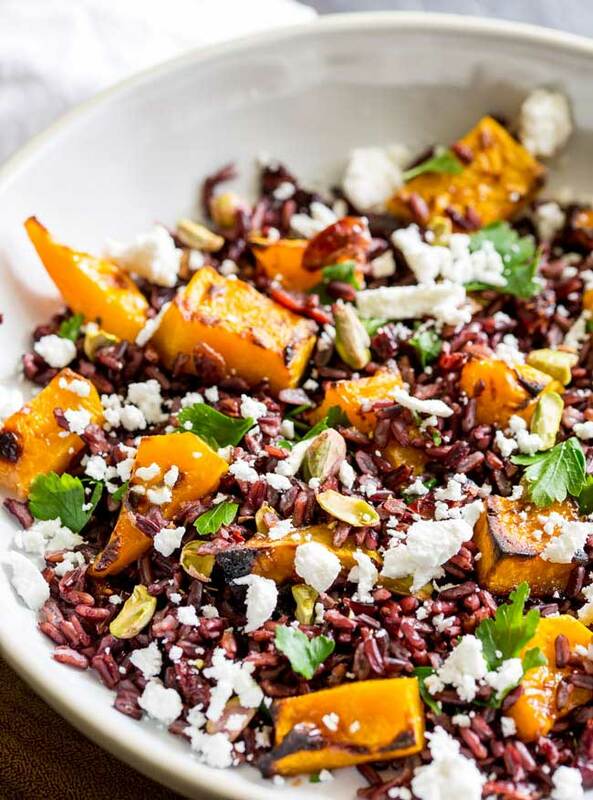 This Black Rice, Goats Cheese and Maple Roasted Pumpkin Fall Salad has it all!!! 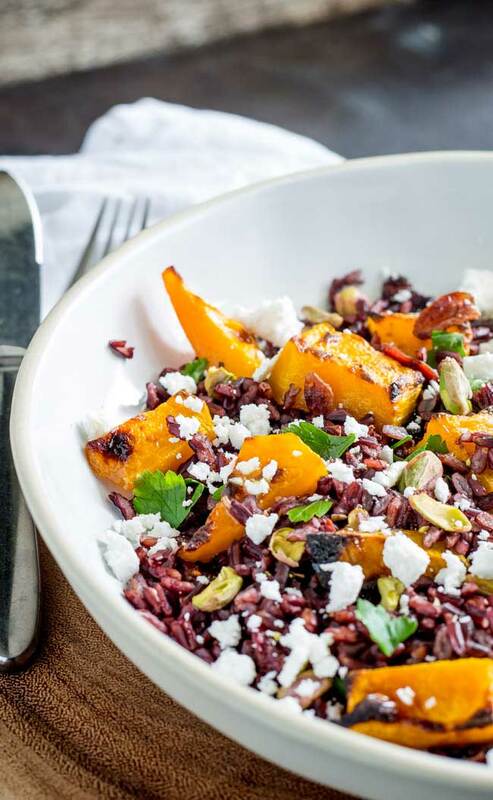 Nutty sweet black rice, sweet smoky pumpkin, fresh tangy goats cheese, sweet cranberries and crunchy pistachios. Delicious as a main or a side, this is the perfect dish for Thanksgiving. Place the black rice in a sieve and wash the a couple of times. Cut the pumpkin in half and use a spoon to remove the seeds. Cut/peel the skin away from the pumpkin and then cut the flesh into chunky 'pieces'. Mix together the olive oil and maple syrup, season the mixture with salt and pepper and then drizzle over the pumpkin. Roast for 25 minutes until soft and charred on the edges. Whilst the pumpkin is cooking prepare the dressing. Combine the extra virgin olive oil, orange juice, mustard and maple syrup in a screw-top jar/bowl. Sprinkle over the dried cranberries, pistachios and then the crumbled goats cheese. Serve with a drizzle of the maple dressing. 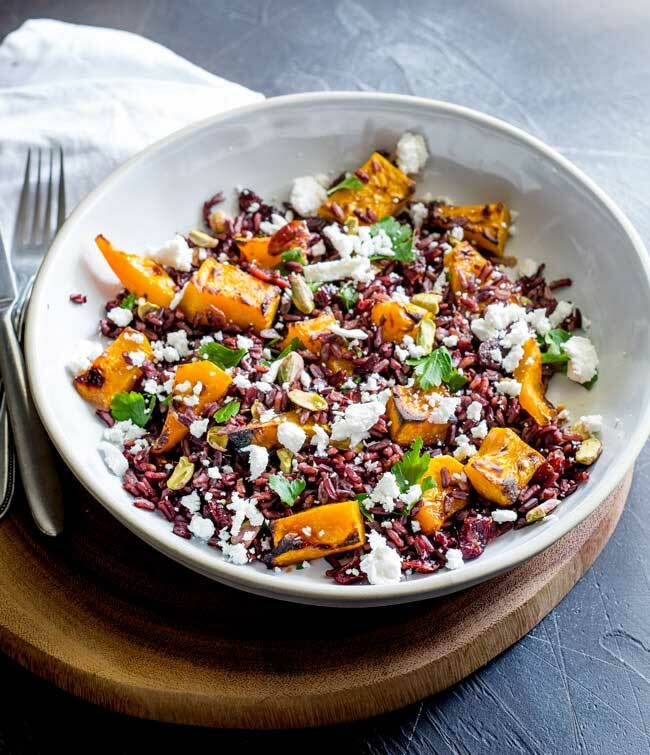 If you love food why not subscribe to my newsletter, I will drop you an email every now and then, just to say hi and send you a couple of recipes think you might love, like this Black Rice, Goats Cheese and Maple Roasted Pumpkin Fall Salad. Hi Claire! I want to try this recipe. What is evoo? Hi Kristin, sorry, I’ll change it in the recipe. It is Extra Virgin Olive Oil. I found a goats cheese that was pumpkin spice favored and added it to this recipe. It was nice! This recipe is amazing and I’m sure I will make it many more times! Thank you! Oh wow!!! That goats cheese sounds amazing. 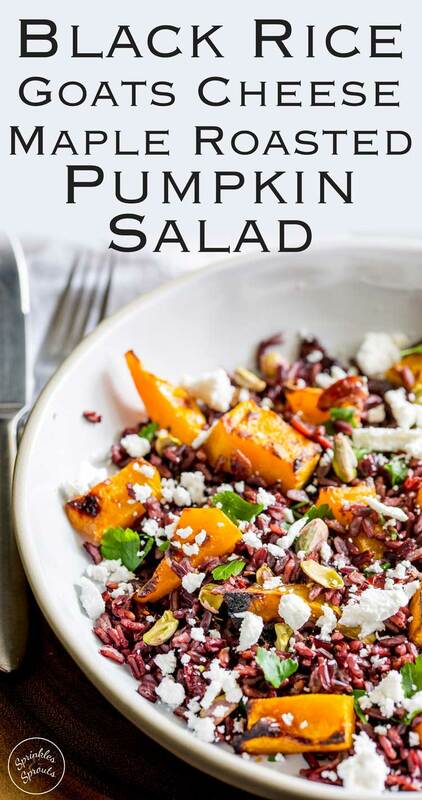 Mmmm…this beautiful fall salad is so delicious! I’m excited to share this recipe with my sister. It’s now officially on the menu for this year’s Thanksgiving dinner. I am so happy to hear that Denay! 😀 I hope you have an amazing Thanksgiving. It is just perfect as part of a celebration as it looks as gorgeous as it tastes. Oh my this is delicious! Loving all the flavors, textures, and color in this beautiful dish!!! Thank you! I am a passionate lover of salad but this is a first time I am seeing such an awesome recipe. Excellent, easy, nutrient-dense and healthy salad recipe. 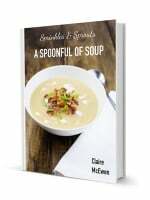 Can I add a bit of lemon zest, Claire? I think a touch of lemon zest would work fabulously. The photos are absolutely BEAUTIFUL. Loving the Fall colors of the dish. I have so many different types of rice at home, I’m not sure I could justify buying black rice as well… but that doesn’t mean I won’t do it. Looks like a good recipe! I know what you mean about types of rice!!! I am always buying different variants of things! Last time I sorted out my pantry I had 8 different types of salt!!! !